Messaging is rarely done via the old-school SMS texting these days. The advent of the multitude of messaging apps that make it easy and free to chat with numerous people at once, exchanging media files and creating groups has made it a bliss to stay in touch at all times. In most cases, we join the groups and apps our social circles use. Some hang around in Facebook Messenger, others in Hangouts, Line, Viber, but the predominant majority probably stick to WhatsApp. However, the latter has major privacy and security issues, as if being acquired by Facebook is not a reason grand enough to question its stance on user privacy. Snowden’s files have shed some light on how the major corporations are aggregating billions of user profiles on their users, including via their smartphones and the apps installed on them. You might feel as if your modest persona is of no interest to data mining ad agencies, but the real problem is that data is of interest to hackers mining user data for identity theft purposes, or worse, your nosy exes, jealous partners and friends, envious colleagues. Hence, a need for a more secure messaging app arises, but what if you do not possess the necessary savvy to dive deep into the serious anonymity-ensuring apps? What if you need something very WhatsApp-like, familiar and simple, with the same or even better features, that would be easy to convince your friends to switch to in order to protect your communications? Today, we place Telegram in the spotlight – it offers end-to-end encryption for secret chats, groups for up to 200 people, a multitude of features and stickers, a free for life service, and quite a large audience as of now. Let us take a detailed look at the app. Browser app, Mac, Windows PC and Linux. First of all, Telegram offers Android, iOS, Windows Phone, web browser and desktop applications, which means you are no longer tied to your smartphone to stay connected. You do need a phone number to register, just as you do in WhatsApp, but you can have your desktop client and take full advantage of your favorite keyboard and content sharing on desktop. This is one nifty feature of Telegram – if you wish to connect with someone, but don’t feel like sharing your phone number with them, you may just share your nickname you use in Telegram. That way, they can find you and chat with you, but they won’t know your phone number. It is important you understand the difference between a regular chat in Telegram, and secret chat. The former is un-encrypted while the latter is encrypted by default. 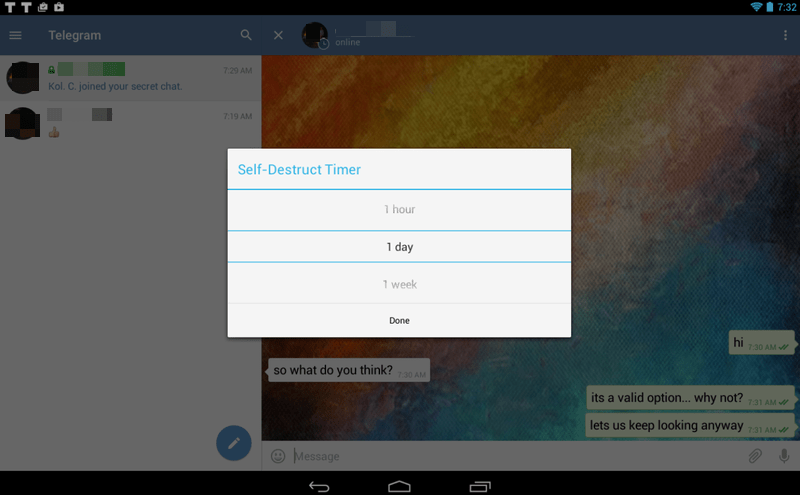 The secret chat has a self-destruct timer, which you can turn off or set for as long as you need. For example, you can set for your messages to self-destruct after 1 second upon delivery – if your friends read really fast. There is a nice selection of self-destruct time in seconds, minutes and hours, days and weeks, so you can decide how you like it. 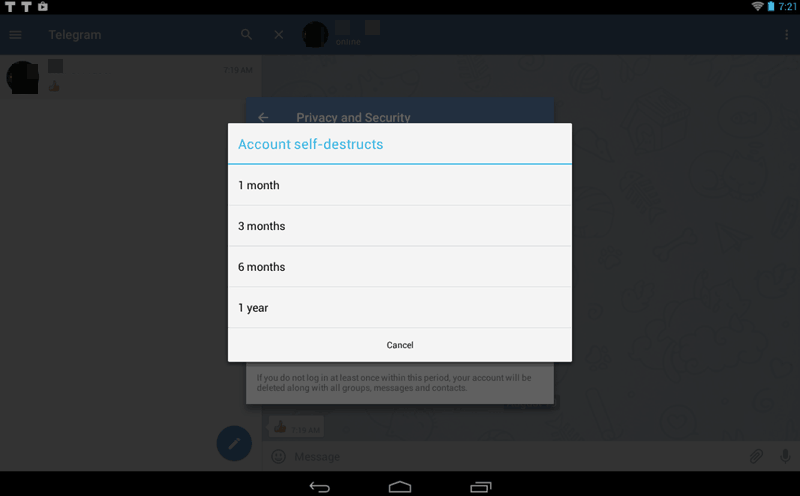 You can also delete the entire history from a secret chat, and mute the notifications. That way, even the closest people in your environment won’t know about the arriving messages. 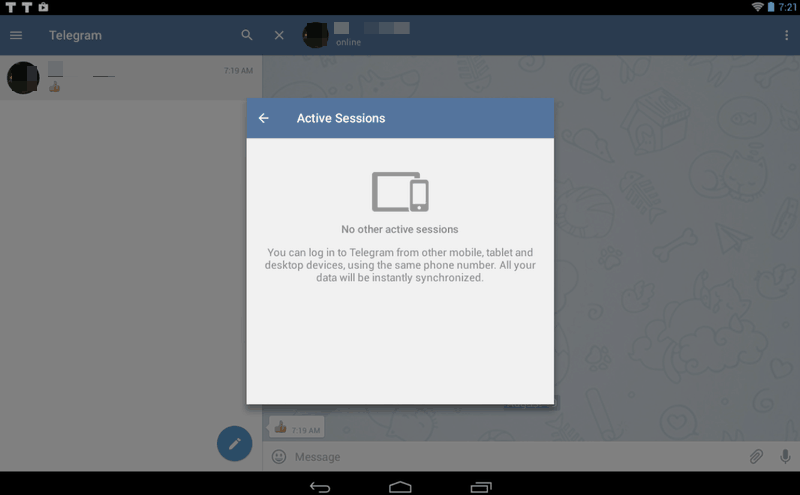 Another useful tweak the developers made to the app is let you see the open sessions of your app. Go to Settings → Privacy and Security → Active Sessions. There, you can see which instances of your account and on which devices are open, and choose to close the spare ones, if they’re running. In the same Privacy and Security window you can set a passcode lock, two-step verification and define the account self-destruct timer. The latter seems a very useful feature, which lets you set the destruct timer for your account after it has not been used for a long time, like six months. There are options, which is fine. Mind, though, that once the account is deleted, all its associated messages are deleted, too. This means if you install the app again and register the same phone number, you will not recover your old messages, which is fine privacy-wise. 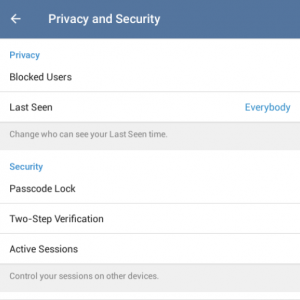 Now, some people like to keep a low profile on social networks, including the messengers, and turn off the Last Seen feature. 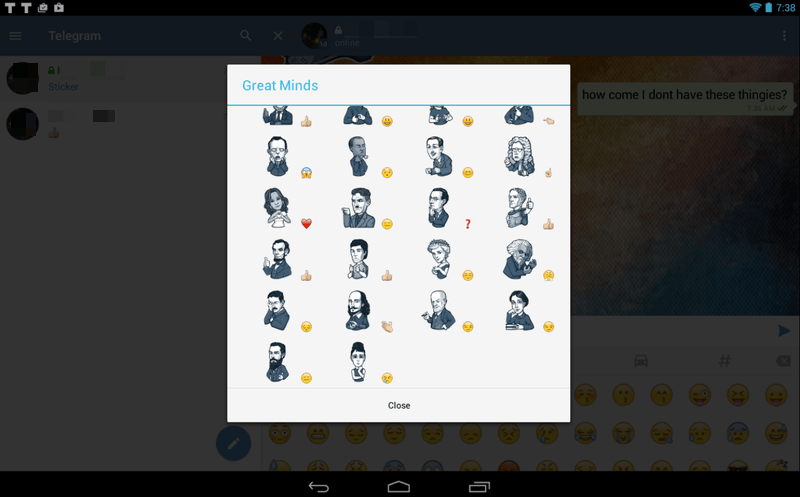 Telegram takes it one step ahead of its competition, and lets you create exceptions. 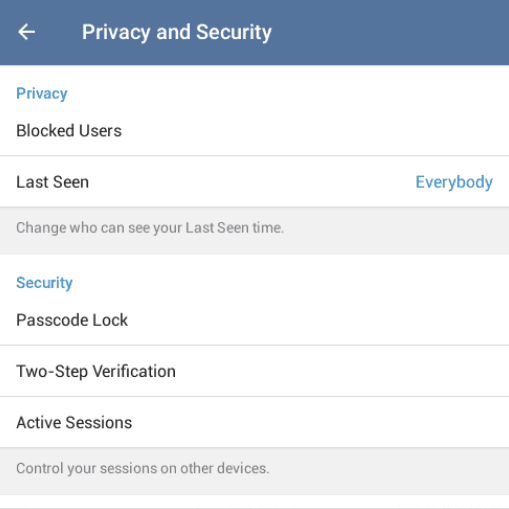 “Always share with” or “Never share with” let you add usernames or phone numbers of your contacts, and there you have it – your filtered list of trusted contacts and everyone else, the accidental friendships that sometimes border on stalking. In terms of functionality, Telegram is way more streamlined and faster than its older competitors. The messages get delivered quite fast, and the features are far-reaching. 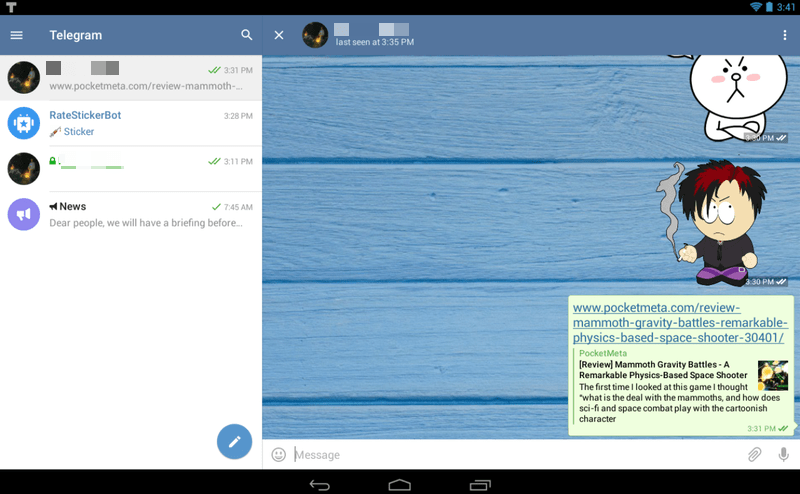 Telegram does use the cloud to sync your chats across your devices. That is why it is important you filter what is sensitive and better kept in an encrypted secret chat with a self-destruct timer, or in regular chat rooms and groups. However, you can’t deny the convenience that comes with the cloud sync. This one is really neat because Telegeram lets you share really big files of up to 1.5Gb, including doc, pdf, zip, images, video, audio. This is what I am really enjoying in Telegram because while some people share images and video files, my friends and I share common interests in music and performing arts and like to share YouTube videos. 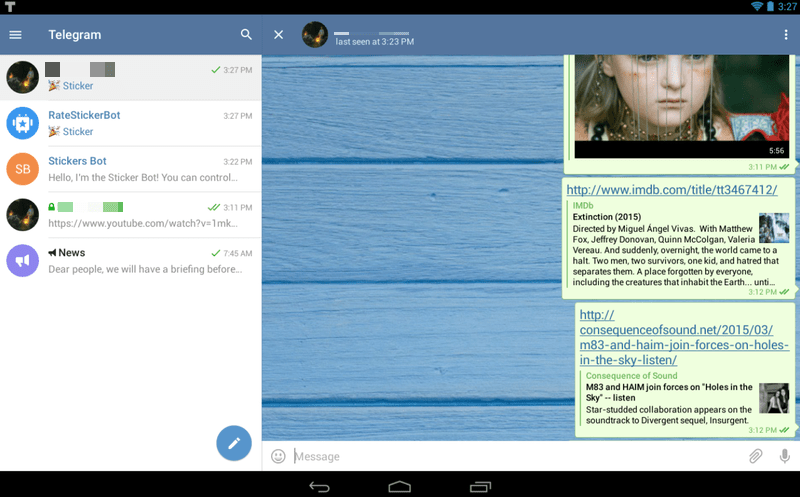 Telegram lets you view them inside the app, without sending you away to your YouTube or browser app. The app automatically generates a preview window with the description text and when you click it, the app opens the video in the chat window without closing or obscuring the chat itself. Of course, it looks better on a tablet, but still is a great option for phones as well. The links you share via the app also come accompanied by a description and preview, with images when applicable. 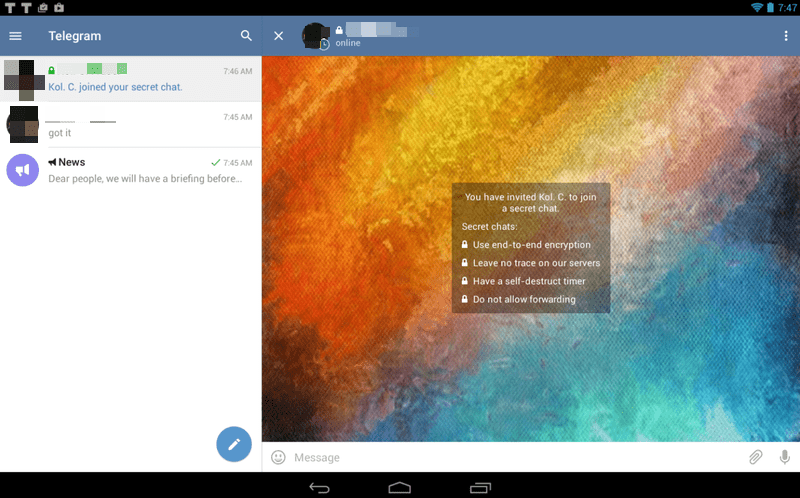 Just like in any messaging app, Telegram lets you customize the way the app downloads the media files your contacts send you, and you can disable auto-download for everything – mobile data, WiFi and roaming, if you fear someone might want to send you a malicious file. Now, Telegram lets you create groups of up to 200 members, and you can even migrate from other apps to Telegram groups preserving your chat history. 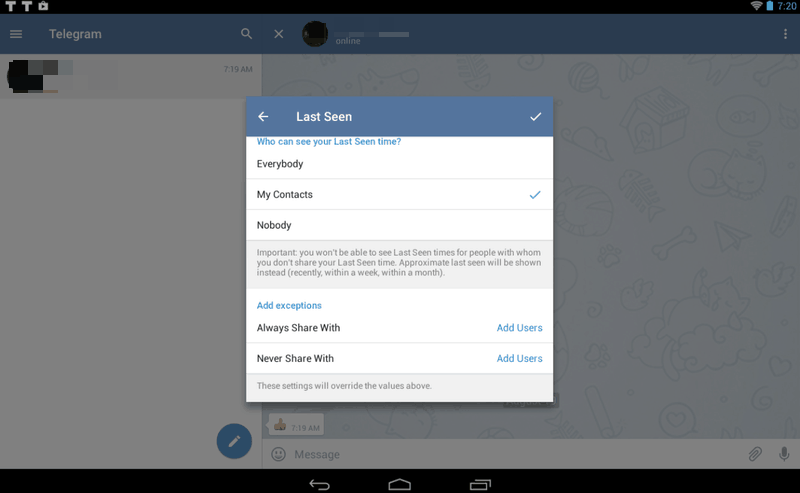 Previously, you would need to have all the contacts added one by one to the new group, losing the chat history. Now, you create a group in Telegram, go to “Add participant…” and tap “Invite to Group via Link.” You send the link to your old group chat in another app, the users would need to have Telegram installed, of course, and once they tap the link – they will have migrated to the Telegram as a group. Sometimes, groups just don’t work out as intended. You create a group to share some notifications, but the members start flooding the chat with irrelevant stuff, and your important messages sink in the multitude of chit-chat, wishes of well-being, seasonal flu epidemics, Mother’s day rhymes, images of roses and Teddy bears – you know how it works. Before you know it, someone misses that important notification and starts whining. This is when Broadcasts come handy. You, as an admin, create a Broadcast, which lets you add up to 100 contacts. That’s it. Whenever you send a message via Broadcast, it delivers the message directly to your contacts in the individual chat room – yours and the contact’s. The message gets delivered to all contacts individually, without the common environment to flood. Should questions arise, you can choose to answer them in individual chats, or via the same Broadcast, just remember to clarify which questions you are answering. In some cases, this feature is a problem-solver for a group admin. Last but not least, the service is free, and ad-free. So, whenever some of your goofy contacts start panicking over “oh no, WhatsApp will be paid since tomorrow, so send this message to 30 contacts if you want to keep it free… until the green icon appears,” you will know for sure it’s spam. I have not had any performance issues so far. The messages and multimedia links and files get delivered very fast, and the overall performance is smooth. I like the Telegram’s blog because it keeps the users up-to-date with the important updates, new features and attacks on its servers. Yes, there was a DDOS attack on Telegram’s servers in the Asia Pacific region, which I think is a sign the app pissed off some government or three-letter agency. Besides, the description says the app’s servers are distributed worldwide, for speed and security, so no one country can lay its hands on everything. 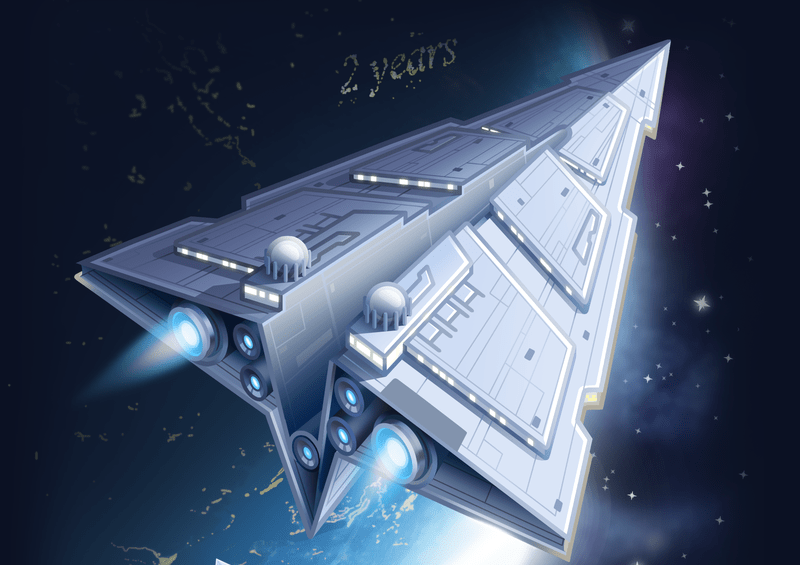 The app is gaining traction, and last month Telegram boasted some of its stats – in December 2015, Telegram delivered 1 billion messages daily, while now they deliver 10 billion messages on a daily basis. That’s impressive, to say the least, and is a good sign more users become privacy-concerned. The numbers also suggest the app is becoming popular and it may be easier to convince your colleagues to try it out. Another nice feature of Telegram is that it’s open for everyone to audit and inspect, which is always a good sign the developers are not hiding any back doors to your sensitive data. (I am looking at you, Microsoft). Finally, the Faqs on this app are probably the most extensive ones I have seen for any messaging app ever, and there are even FAQs for the technically inclined. @ImageBot – send it a keyword and it’ll provide you with a relevant picture. @PollBot – add it to group chats to create polls. @AlertBot – set a time and this bot will send you a custom reminder you make for yourself. @HotOrBot – Tinder-like dating bot. So, there is never a shortage of stickers and images, or GIFs. Say, you found a nice one, so you add it to your sticker set, but you can also send it to your contact(-s) so that they can add to theirs. Smart notifications that notify you of the messages you haven’t received only. For example, when you are using a desktop app, your mobile device will not bug you with the notifications of the messages you are processing in the desktop client. No audio or video calling as of now. According the developers, they are working on providing these with the encryption option, so it might be a worthwhile wait. On the flip side, you can record audio and video messages and deliver them via chats. Telegram beats the competition, there is no denying that. Secret chats for end-to-end encryption is a very welcome solution on top of the log-in instances tracking, muting notifications and passcode app lock for the secretive folks. It’s good to know you can set a self-destruct timer for messages and your account as a whole, and when it gets wiped out, your messages get deleted from the servers, too. For secret chats, encryption keys change after every 100 messages, but the FAQs for the technically inclined explain how to reset them manually. The app sports quite a hefty load of features for fun and productivity, and covers groups and broadcasts, with the possibility to migrate from another app seamlessly. Overall, in terms of the balance between functionality, set of features, ease of use and privacy options, Telegram comes out winning. Try it. Optional end-to-end encryption and self-destructing messages for secret chats, as well as muted notifications on top of the productivity and fun options that surpass many other messaging apps make Telegram a better alternative to the other mainstream apps.